As part of our foray into Southeast Asian cooking, we've started making our own Banh Mi. Given this, we decided that it was quite silly that we had never actually had Banh Mi from a restaurant. Even more silly given that there are a bunch of local options. We just don't get to City Heights very often, which is where most of them are located. Recently, however, the stars aligned. We had some errands to run in Hillcrest and also needed to drive out to Alpine Brewing Co. to get some of their fantastic Nelson Golden Rye IPA during the small window of opportunity before it was all gone. Cafe Dore made a good stop along the way. Not sure what to order, we decided that we could do a lot worse than to try a couple of Kirk's favorites. We liked this sandwich a lot. The filling was a nice mixture of translucent, elastic pork skin along with more meaty bits of pork. Add in the generous bunch of herbs and marinated vegetables tucked into a very nice baguette and it was just perfect. 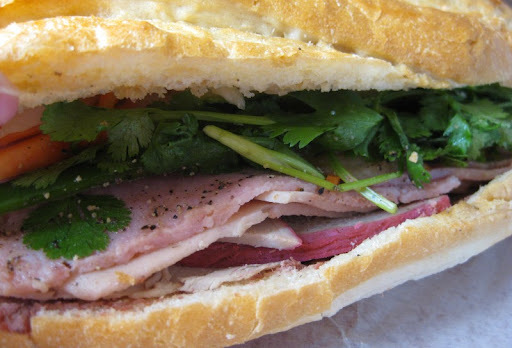 The second sandwich we got was a Banh Mi Dac Biet - a filling of pâté, bbq pork and a couple of types of pressed meat. I enjoyed this one a lot as well, although not quite as much as the Bi. I'm a real fan of the marinated veggies, and there weren't as many on this one. Still, I'd be more than happy to eat this sandwich on a regular basis. 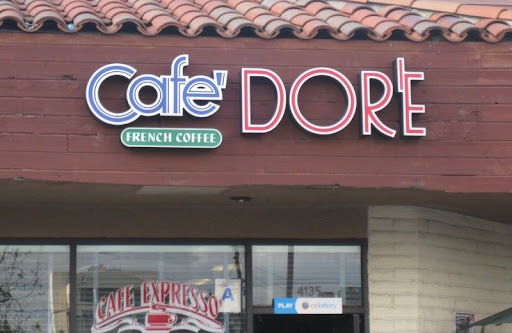 When we got to Cafe Dore, we weren't quite ready for lunch, so we ended up getting our sandwiches to go. They held up just fine until we were able to dig into them when we got home. At $6 for the pair, this was the best lunch deal we've had in a while. 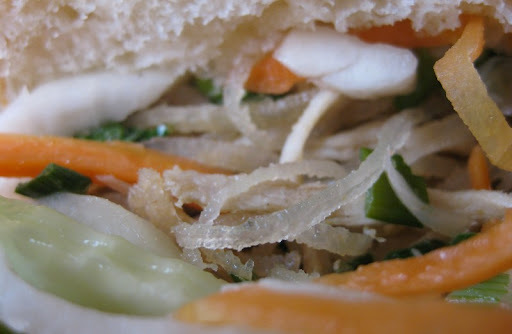 those are some beautiful pictures...the abundance of bahn mi shops is something in sd is something i def. miss....the two closest places where i live now make it, but it's pretty bad...they don't use marinated veggies!! it's only shredded carrots and iceberg lettuce. Hi Sawyer - it definitely wouldn't be the same without the marinated vegetables. I particularly like nice big chunks of cucumber - they add a really refreshing contrast to the meat filling. Cafe Dore mmmmmm great pictures you made me hungry. Hi Mike - Thanks for the shout out! 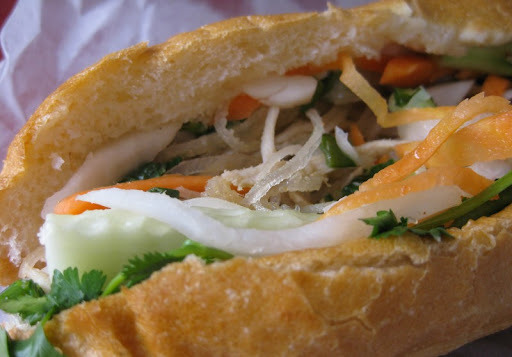 I'm glad you enjoyed the Banh Mi....Saigon Sandwiches next door does a great job as well. I enjoyed their Xiu Mai Banh Mi as well.